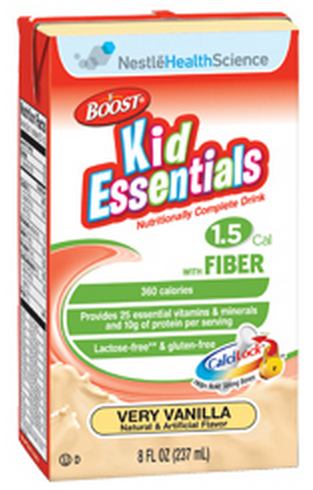 Boost Kid Essentials Fruit Nutritional Drinks are a complete nutritional formula designed for children ages 1-10. 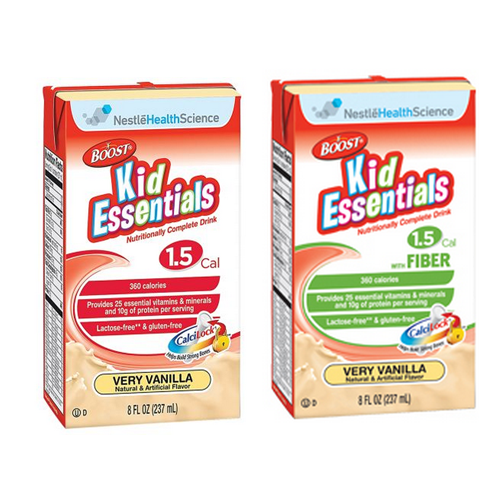 Boost Kid Essentials is available with or without fiber. 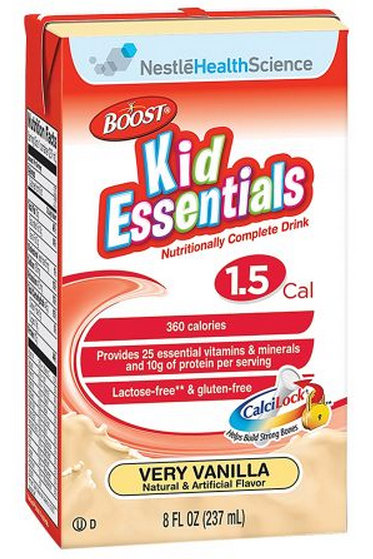 Providing 1.5 calories per mL, Boost Kid Essentials is rich in calcium to help grow strong bones. 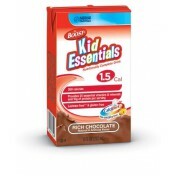 Manufactured by Nestle, this nutrition product may be consumed orally or as a tube feeding. 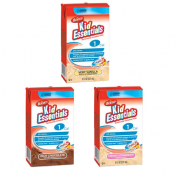 Boost Kid Essentials Product Numbers: 33500000, 33540000. 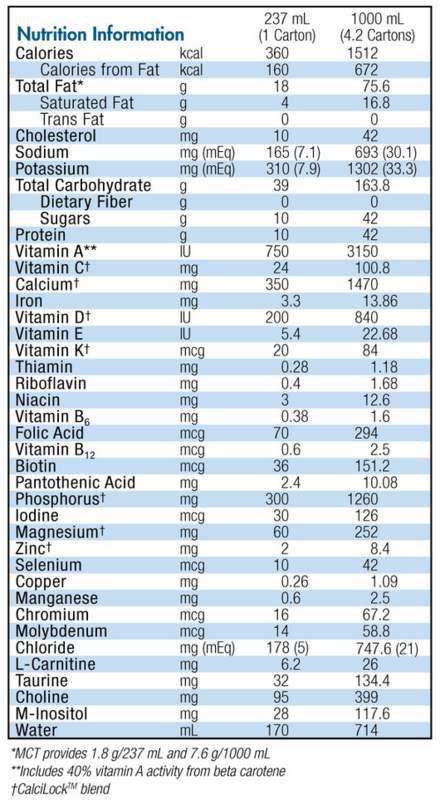 Application: Pediatric Oral Nutrition Supplement. 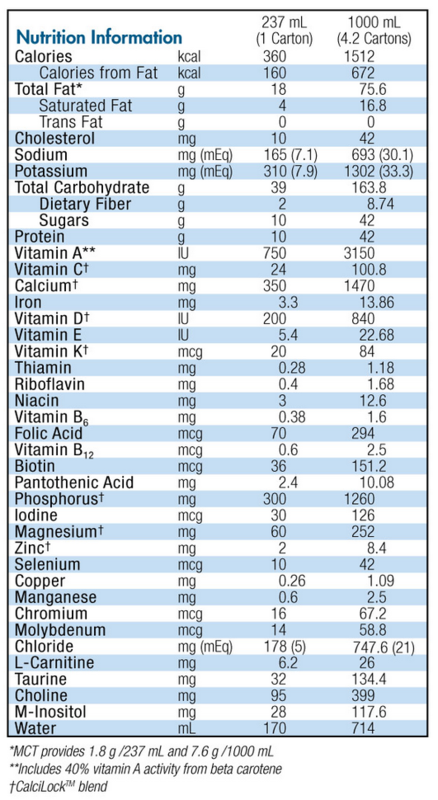 Water, Maltodextrin, Soybean Oil, Sodium Caseinate (from Milk), Sugar and less than 2% of High Oleic Sunflower Oil,Whey Protein Concentrate, Medium Chain Triglycerides (from Coconut and/or Palm Kernel Oil), Calcium Caseinate, Calcium Phosphate, Potassium Citrate, Soy Lecithin, Magnesium Phosphate, Cellulose Gel, Ascorbic Acid, Choline Chloride, Carrageenan, Potassium Chloride, Salt, Natural and Artificial Flavor, Taurine, Cellulose Gum, Ferrous Sulfate, L-Carnitine, Alpha-Tocopheryl Acetate, Zinc Sulfate, Calcium Pantothenate, Niacinamide, Vitamin A Palmitate, Vitamin D3., Manganese Sulfate, Copper Gluconate, Riboflavin, Pyridoxine Hydrochloride, Thiamine Hydrochloride, Inositol, Beta Carotene, Folic Acid, Chromium Chloride, Biotin, Sodium Molybdate, Sodium Selenite, Potassium Iodide, Phytonadione, Vitamin B12.